Post Offices, by tradition and definition, also play a role in financial history. They would physically transfer cash when money was sent via the Post. Also, instruments such as the 'Postwissel' (postal order) would provide a means of sending money to other people, without the need for sending the money itself. This postal order worked either within the country or to people in other countries. But, as the Post Offices themselves are closing, with TNT Post and ING choosing their own locations for the delivery of their respective services, the postal order is by now a thing in the past. That is: here in the Netherlands; it is still available in other countries and one can of course always also use the US equivalent... Western Union. Update as of Friday 28 October: There is a really smashing panorama foto available through ab-c media weblab and thanks to fotographer Frank van der Pol. It's a very nice example of the possibilities of panorama-photography with augmented reality touch. I am placing a smaller embed here, but you would most certainly want to look fullscreen (right button) and check out the Dutch page of ab-c media weblab that explains all the features and the building. But trade and greed is of all times. In the 18th century coffee houses (koffiehuizen) would be the spot to do some extra trading. Including trades with borrowed money. And the buying of equity of new companies (not all with a solid business model). So when the equity issuing went sour and the south sea bubble burst, Amsterdam saw a sort of Occupy Kalverstraat movement. A crowd gathered and focused its anger on the coffee house at Kalverstraat 25. 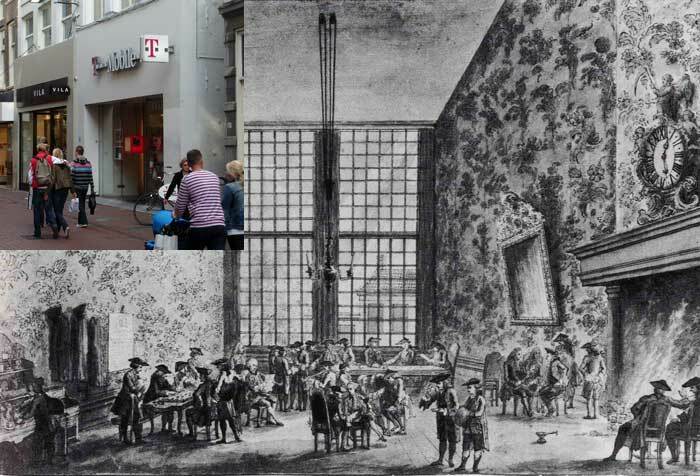 See also the Dutch information in this page and the picture below (showing the old coffee house and its current owner: T-mobile). Needless to say that I was very curious what would be happening at our Wall Street here in Amsterdam. 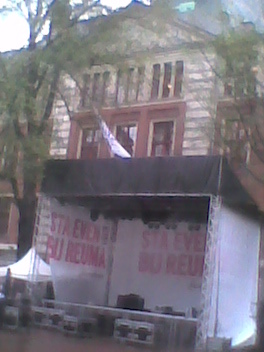 Beursplein 5. Would any of the protestors know that the square that they would be on, would be the design of a socialist and idealistic architect (Berlage)? And what would they protest about? So I went there this afternoon and indeed there was some action. A whole podium was built. So I figured: my, my, this is an organised movement indeed. And I was impressed with this Occupy-Beursplein 5. Then I looked a bit better. And I noticed the text. It read in big red letters: 'Stop by to consider rheumatism'. Perhaps that is somewhat typical of our Dutch willingness to revolt. Rather than occupying Beursplein 5 with protests against bank bonuses or other elements of greed, we occupy it with a rally to collect funds for people with a disease. Would that be the Dutch way? On the website of Andre van Eerden I found some foto's of the Optiebeurs. The First Amsterdam Options Exchange opened in 1978 here in Amsterdam and was the first in Europe to do so. It stands out as another nice example of Dutch adaptation of financial innovations. In the book by Pieter Vlaardingerbroek we can read that a visit of Maria de Medici in combination with increased self-awareness led to the decision to build a new city hall. And this new city hall soon became known as the 8th world wonder, as it was so huge and full of grandeur. Quite a number of buildings were taken down to be able to build the new city hall, so that leaves us with the question: where was the old city hall? Well, luckily the book answers that question as well. It contains a map that shows the proper location. 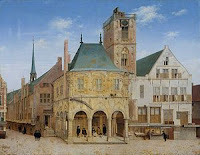 So we can see that the city hall was actually close to the kalverstraat (on the left). If you draw a line from the kalverstraat to nieuwendijk, you would find the city hall right on that line.